Doug has lived in Sarasota since 1955. 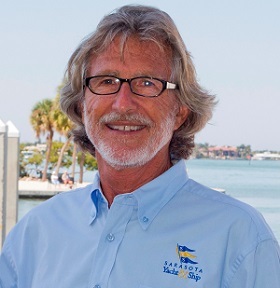 He founded SYS in 1986 and has owned and operated the 200-slip, Harbor Marina, selling new and used boats, with one of the largest service yards in the area. The marina serviced all brands and was the largest Californian dealer in the country for 4 years. Doug credits his brokerage success to the lessons learned while at the Marina. Doug has a passion for boating and is very energetic about representing his clients. At our downtown and marina locations in Sarasota, we start with knowledge and dedication; we proceed from the first phone call to the closing with the aim of making boat-buying a pleasurable experience. Our referrals make us the most recommended Brokerage firm in the area. We wish all brokers took the time you did to talk to us to find out just what we wanted in a boat and then took the time and effort to find it. Your guidance, expert knowledge of boats, and exceptional negotiating skills throughout the process were essential to making everything work as well as it did. We encourage all other customers to listen closely to your sound advice and expertise in boats. After a lifetime of boating, it was hard to believe that you could find us a boat that had everything we wanted and more, and at a price we were happy with. You are a true professional. Not only did you work hard to get us what we wanted, but you also made very sure that we knew exactly what we got. You can be sure that if anyone we know is in the market for a boat, we will definitely send them to you. Again, thanks so much.